Newbie at wine, have questions on fermenter size. This year my dad and I decided to try our hands on making some wine. We picked up a few WineXpert kits, his had the grape skins addition and mine was just the concentrate. We are currently primary fermenting both in buckets, his bucket is larger due to the grape skin addition and mine is a standard beer brewing bucket. 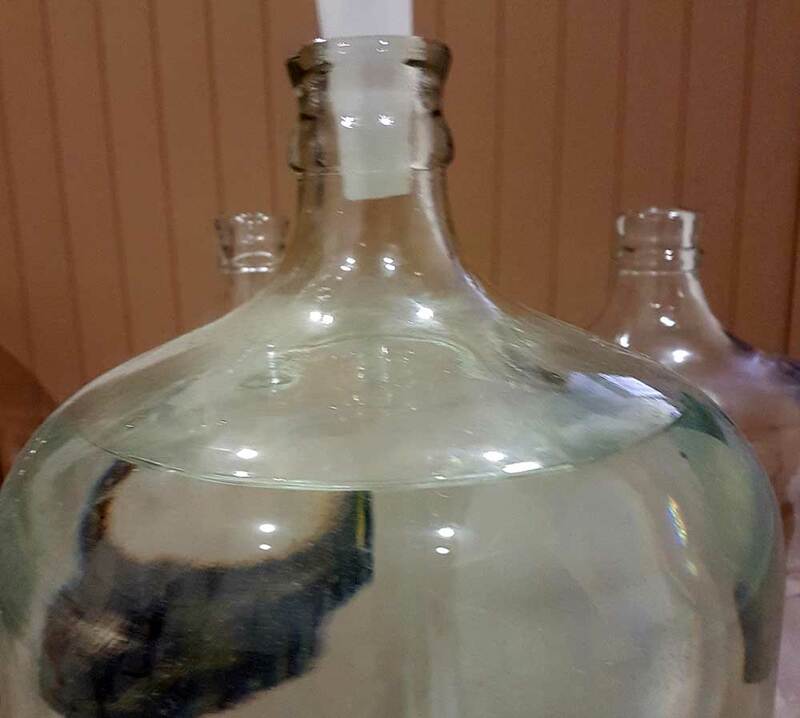 I currently have 4 glass carboys, of unknown size, my guess would be 6.5 gal. They were given to me from my father in-law who got them from a friend. I filled one of them to 6 gal exactly and this is where the water came up to. 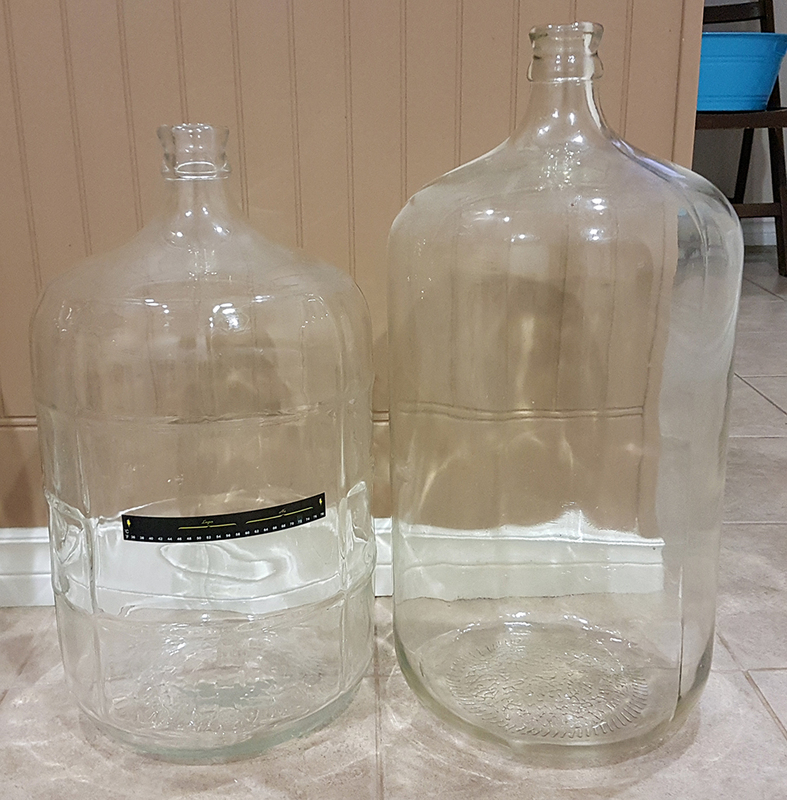 Here is a side by side comparison of my 5 gal carboy on the left. Now seeing as though I have to do secondary fermentation on one batch and then degass and clearing on both, will the amount of head space in the carboy be too much for both batches? Pulling from primary to secondary and then from secondary to tertiary I can see not getting 23ltrs exactly since there will be sediment on the bottom each time. Would you recommend topping up with water or using a similar wine to reduce the head space? Thanks in advance for all the help and insight. Re: Newbie at wine, have questions on fermenter size. i have made a few of the WineXpert kits, Pinot Noir is our fav. I ferment in my 6.5g glass carboy then rack off into my other 6.5g carboy. I de-gas in secondary and add the rest of the packs of the kit. from there i usually let it sit for 2-3 weeks if there is no sediment then i bottle. if there is, i rack to the other carboy and let sit for another 2-3 weeks then bottle. I wouldnt add anything to fill the headspace. now if you were going to do a barrel and let it sit, then i might say get a bottle or two of the same wine type and fill it up the headspace. but not for a normal kit. p.s. leave a few of those bottles in the cellar for a year then pop a cork and see the difference. I was told by my LHBS that I should either top off with no more than a liter of water or add similar type of wine. how long are you going to do secondary and tertiary? if less then 2 months, i wouldnt worry. Craig drinks from his carboy sometimes, with no problems. however it is your wine, so ultimately its your call. do what makes you feel comfortable. My dad's kit however is saying to secondary after 7 days in primary, wait 10 days then degass/stabilize/add clearing agents. After 8 days transfer to another carboy to clear for 28 days. It says not to top up after degassing yet doesnt say not to top up during the secondary or degassing stage. IMHO i wouldnt top up, you could possibly change the flavor of the kit or reduce the ABV by adding water. and adding the same wine seems like a waste to me unless, like i said you were to do a barrel age. if these are your first wine kits I would stick to the instructions that way you get a base of that kit and if you like it then the next one you can play around with it to boost the flavors. I did add some tannin to one of mine, Black Dog Brewery had mentioned this to me so i tried it and i liked it. but i only have done a couple of wine kits. i miss having the other guys around to chime in on stuff like this. keep us posted on what you do. Sorry BDRJ for being a little late to this party . . . But once the wifey saw how much was invested in Home Brew equipment, the LHBS who also sells wine kits told her that I already have everything I needed to make her cabernet. - Always top off your headspace with a similar wine. Not water. Leaving just the neck of the fermenter empty is fine. Topping off with a drier wine is preferred because most of the kits (even the more expensive kits which include the skins) will inevitably come out sweater than what you are expecting. - The biggest piece of advice that I have given here in the wine forum is DO NOT BOTTLE your wine if you thief out a sample and it has defects (typically too sweet). I am responding late to your posting, but I'm guessing from the date that you still haven't bottled yet. I was in denial for my first 2 kits thinking the wine would improve in 2 years. Not going to happen / ended up with some great Sangria. Once you push in that cork you've sealed in the defects which don't improve with age. Bring a sample to your LHBS. Even though they gave you bad advice to top it off with "water", ask them for a solution of how to fix the wine before you bottle it. Thanks for the reply everyone. My dads kit I actually only ended up adding about 2 cups of distilled water which in the grand scheme of things I cant imagine it making a big difference in 6 gals.